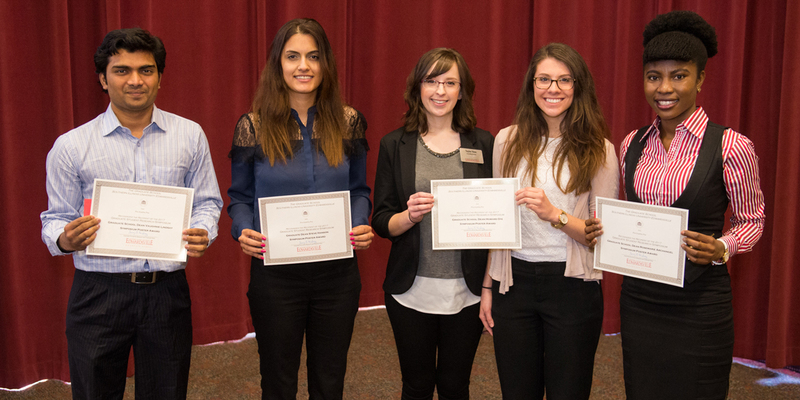 The purpose of Research Grants for Graduate Students (RGGS) is to support research and creative activities initiated and conducted by SIUE classified graduate students to enhance their academic progress. Although faculty advisors oversee the research or creative activity, the purpose of this program is to support the graduate students' work, particularly as it relates to their thesis or final project. Proposals not received by the established deadline are not reviewed for funding. Previous RGGS recipients are ineligible for a second grant. Applicants may request up to $500. Awards may be granted for the full amount requested or for a lesser amount, depending upon availability of funds and the appropriateness of the amount requested. Awards are based on the merits of the proposal and eligibility of applicant. All meritorious applications are funded up to the limits of the RGGS funds available for each academic term. Students must maintain good academic standing and enrollment during the tenure of the grant. Students may be allowed up to nine months to expend grant funds and submit a final accounting report. Awards are for future expenditures only. Recipients cannot request funds to reimburse money spent before the RGGS is awarded. Please Note: Funds are distributed to the student's department of study for their expenditures. Student may begin spending their award when they have received their award notification. However, award funds will not be distributed to the department until the award date. Federal statutes establish mandatory training for all researchers. Any research involving human subjects, animals, biohazardous materials, or recombinant DNA must comply with university policies and regulations available at https://www.siue.edu/compliance. Protocols must be approved by the appropriate board prior to any data collection. Research involving human subjects must be reviewed and approved by the Institutional Review Board (IRB) before any aspects of the research commence. If your research contains human subjects, you will need to log into the Kuali Online IRB Protocol System to create and submit your protocol. For more information regarding IRB and Kuali, you can go to https://www.siue.edu/compliance/human-subjects/index.shtml. Proposals must include all components listed below in a single PDF file. Applicants are advised to follow carefully the prescribed format. Narratives should be double-spaced and should not exceed five pages, excluding the cover page and budget form. The narrative must be written so it can be understood by an educated lay audience. Provide a short narrative justifying the budget. Itemize and detail the budget on the budget request form. The budget request should not exceed $500. Supply a cost for each item requested for commodities, travel, contractual services and equipment. See “Allowable Costs” for examples of appropriate and inappropriate requests. All requested items should be clearly related to the project that is to be conducted. You may not request funds to reimburse departments or other entities for money spent on this project before the receipt of the award. It is recommended that you reference to the RGGS Application Checklist before submitting your proposal. Travel for the purpose of gathering data which could not be obtained otherwise: mileage, commercial fare, lodging, and per diem. *Please note that any equipment purchased with the RGGS grant funding becomes the property of Southern Illinois University Edwardsville. The purchases must be returned to your department once you graduate and are no longer affiliated with the University. Funds will be transferred to an ICR account within the department. It is the responsibility of the individual researcher to expend funds only for approved items. The unit and major advisor are responsible for overseeing the appropriate use of the funds in a timely manner.